RP Photonics can give helpful advice on laser safety, in particular on various technical aspects and on practical safety guidelines. Note: this article is meant to provide some basic information and reasonable guidelines for laser safety, rather than a precise document on official regulations. RP Photonics does not accept any legal responsibility for the correctness of details. Laser beams can be hazardous, particularly for the eye (and sometimes also for the skin), mostly because they can have high optical intensities even after propagation over relatively long distances. Even when the intensity at the entrance of the eye is moderate, laser radiation can be focused by the eye's lens to a small spot on the retina, where it can cause serious permanent damage within fractions of a second – even when the power level is only of the order of a few milliwatts. Damage can result from both thermal and photochemical effects. Laser damage of the eye is not always immediately noticed: it is possible e.g. to burn peripheral regions of the retina, causing blind spots which may be noticed only years later. Ultraviolet lasers can cause corneal flash burns, a painful condition of the cornea. UV radiation can also cause photokeratitis and cataracts in the eye's lens. (For these reason the XeCl excimer laser has acquired the nickname “cataract machine”.) Mid-infrared lasers, particularly those operating at certain wavelengths with very strong absorption in the cornea (e.g. 3 μm or 10 μm), can also cause painful corneal injuries. How much light an eye can tolerate depends on many circumstances: not only the intensity, but also particularly the wavelength and the duration of irradiation (e.g. the pulse duration). There are detailed sets of rules for calculating safe exposure limits (maximum permissible exposure, MPE) for a given situation. Such rules are occasionally revised according to new scientific findings. Eyes are particularly sensitive, but laser radiation can also cause skin injury. For infrared light, this occurs mainly via thermal effects (thermal skin burns), similar to burning the skin with other means. The penetration depth depends on the wavelength, and for such reasons a laser beam at 1.5 μm wavelength causes more pain on the skin than a 1-μm beam. Whereas such burning should in most cases not have serious long-term consequences, ultraviolet light can in addition induce photochemical reactions. These can lead to changes in the pigmentation, erythema (sunburn), and (most importantly) skin cancer. Intense laser beams can incinerate materials and thus possibly start severe fires. Particularly in laser material processing, poisonous fumes, dust or hot droplets of molten material can affect nearby workers. For example, fumes containing arsenic, chromium or nickel can occur when metal pieces are cut, and plastic parts (polymers) can form dangerous organic substances. Secondary radiation (e.g. ultraviolet light or even X-rays) can be generated when high-intensity beams heat certain targets to high temperatures. High electric voltages are used in laser power supplies (e.g. for discharge lamps), creating hazards in maintenance operations or when cables are damaged. Some laser systems contain hazardous chemicals such as certain laser dyes. Other lasers contain potentially exploding or imploding glass tubes (e.g. arc lamps). In fact, probably most victims of accidents with lasers have been hurt by such hazards (particularly by electric shocks) rather than by laser radiation. High-voltage power supplies can be dangerous if workers can come into contact with the inner parts or with a defective high-voltage cable. Some lasers require the handling of hazardous chemicals, e.g. carcinogenic dye solutions in dye lasers. Some of these solutions can penetrate the skin, and therefore need to be handled with special care. Near-infrared laser beams are much more hazardous than visible light with the same power level, because their radiation is focused to the retina just in the same way as visible light, whereas the blinking reflex of the human eye (normally closing the eye's lid quickly when the intensity is too high) is not active. Also, no warning is possible e.g. through weak stray light: nothing can be seen when a dangerous beam propagates in an unexpected direction. Ultraviolet lasers endanger not only eyes, but also the skin (see above). Pulsed laser sources, e.g. Q-switched lasers or regenerative amplifiers, generate pulses with a peak power many orders of magnitude higher than the average output power even of a high-power laser. A single pulse from a hand-held miniature laser can totally destroy an eye. In open laser setups, parasitic specular reflections (caused either by parts of the setup or by movable metallic tools, watchbands, rings, etc., but also by the residual reflectivity of anti-reflection coatings) may allow hazardous beams to leave the setup, which might hit someone's eye. 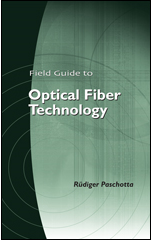 Optical fibers, e.g. transporting high optical powers between different rooms, may release dangerous radiation when being damaged. They therefore need to be specially protected and marked. High-power lasers (e.g. with powers in the kilowatt region) can damage not only the eye but also the skin within short exposure times, and can easily start a fire, e.g. when the beam hits materials such as wood or plastics; toxic fumes may also be generated. To give some guidance on adequate handling and required precautions, laser devices are assigned to different safety classes, with class 1 being the least dangerous (containing e.g. lasers with microwatt power levels) and class 4 the most hazardous one. Note that the assignment to a laser safety class depends not only on the laser power, beam quality and laser wavelength, but also on the accessibility of hazardous areas: even a high-power laser may be in safety class 1 when there is no risk that dangerous radiation can leave a fully encapsulated housing. Details such as the large diameter or the divergence of involved laser beams are largely ignored in such simplified classification schemes. The concept is solely to classify the laser product itself according to some emission limits, rather than evaluating a particular setup containing a laser. The classification is indirectly based on some exposure limits for the eye (see above), but also takes into account a number of worst case assumptions concerning e.g. the distance of persons from the laser aperture, the exposure duration and the possible use of optical instruments. Therefore, the classification tends to overestimate certain risks, and a complete safety assessment has to consider the details of the whole setup and the way it is used. Table 1: International laser safety classes, with somewhat simplified and approximate descriptions. For details, consult the applicable laser safety standard documents. 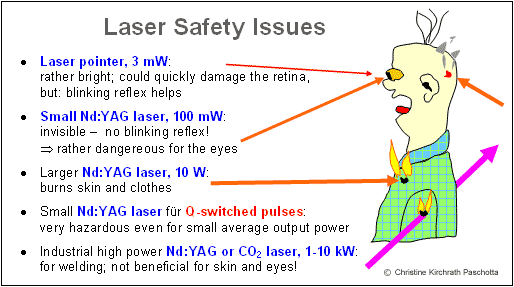 1 The accessible laser radiation is not dangerous under reasonable conditions of use. 1M The accessible laser radiation is not hazardous, provided that no optical instruments are used, which may e.g. focus the radiation. 2 The accessible laser radiation is limited to the visible spectral range (400–700 nm) and to 1 mW accessible power. Due to the blink reflex, it is not dangerous for the eye in the case of limited exposure (up to 0.25 s). 2M Same as class 2, but with the additional restriction that no optical instruments may be used. The power may be higher than 1 mW, but the beam diameter in accessible areas is large enough to limit the intensity to levels which are safe for short-time exposure. 3R The accessible radiation may be dangerous for the eye, but can have at most 5 times the permissible optical power of class 2 (for visible radiation) or class 1 (for other wavelengths). 3B The accessible radiation may be dangerous for the eye, and under special conditions also for the skin. Diffuse radiation (as e.g. scattered from the some diffuse target) should normally be harmless. Up to 500 mW is permitted in the visible spectral region. 4 The accessible radiation is very dangerous for the eye and for the skin. Even light from diffuse reflections may be hazardous for the eye. The radiation may cause fire or explosions. The IEC standard has been fully adopted by the European standardization organization as EN 60825-1 and is published in national versions such as DIN EN 60825-1 in Germany. Note that these standards cover much more than only defining safety classes; they also determine the measures to be taken in order to work safely with laser products in such classes. There are also government regulations such as the relatively outdated 21 CFR 1040.10, which is still relevant for the US, although the IEC / EN standard is now also accepted there with some additions. Generally, it is the duty of the manufacturer of a laser product to classify the product and to equip it accordingly with warning labels. However, the classification may change when a laser product is modified by a user, and the user is then responsible for reclassification. Originally, the required safety measures for a given laser setup where basically determined only by the safety class of the laser. As mentioned above, this classification does not reflect details such as beam divergence, which can be very relevant for safety issues: a strongly focused laser beam can be so divergent that within a moderate distance after the focus the intensities fall below the allowable exposure level for the eye. In such situations, one sometimes defines a “Nominal Hazard Zone” (NHZ) within which safe exposure levels may be exceed, in order to apply certain restricting measures to this zone instead of the whole room. The risks have to be carefully assessed before anything adverse can happen. They need to be reassessed every time when important circumstances change, e.g. the devices used, applications, staff, and details of the room. On that basis, reasonable ways of dealing with these risks need to be developed. This involves the implementation of technical measures (see above) and establishing suitable working practices. The results need to be clearly described in written safety regulations. Adequate safety education needs to be ensured, such that all people who may be at risk are properly informed about both the risks and the proper ways to deal with them. Personal instruction by a knowledgeable person is certainly very valuable, and should be supplemented with additional training materials such as clearly written notes, a laser safety video or DVD. All responsibilities need to be properly assigned and clearly defined. It is also very important to establish a spirit which motivates all staff to take safety issues serious, recognize responsibilities for themselves and for their colleagues, suggest practical solutions, etc. Regulations must be clear and understandable for those reading them. The rules should be sensible, ideally under all conceivable circumstances: the implied restrictions should be so that all risks are minimized without being in straight conflict with the actual goals of the work. The set of rules should be compact, so that people can be expected to read them carefully and to memorize them. It is clear that various trade-offs are inevitably involved, e.g. between compactness and suitability for many different circumstances, or between safety and productivity. Giving absolute priority to maximum safety while ignoring productivity and similar practical requirements will not even serve safety, because it increases the risk of regulations being ignored or forgotten. It can be difficult task to analyze existing hazards and to identify the most practical way of dealing with them. unexpected effects such as accidentally misaligned beams, vaporization of poisonous substances, defects or poor design of safety equipment, etc. wrong interpretation of labels like “low-power laser”: a 10-mW near-infrared laser may have a low power, but is still very dangerous to the eye! Due to such factors, which are difficult (if not impossible) to eliminate altogether, perfect laser safety (making accidents impossible) is probably impossible to reach. However, sensible regulations can greatly diminish the risks without affecting the productivity too severely. Thoughtful risk assessment and sensible regulations are required before accidents occur (i.e. before the work begins). Regulations must be practical and convincing, because otherwise they are likely to be breached. Staying on the “safe” side by imposing unrealistic and nonsensical rules on workers will undermine the respect for the regulations, and can thus be very counterproductive. All responsibilities must be clarified for everyone involved. The assignment of a laser safety officer alone (possibly as a scapegoat without sufficient time and powers for enforcement of rules) is not sufficient. Stupid arguments for breaching rules, e.g. of the style “we have always done it like that” or “I know others who also do that”, must be banned. Formal adherence to given rules is not sufficient – operators must stay risk-aware during routine work.